Happy New Year! What a great day January 1st, 2014 was for our family! No one had to go to work or school. And since it was literally snowing all day, there was no need to rush off anywhere. So we spent the day nestled at home, cooking and eating and playing in the snow!! I love it! 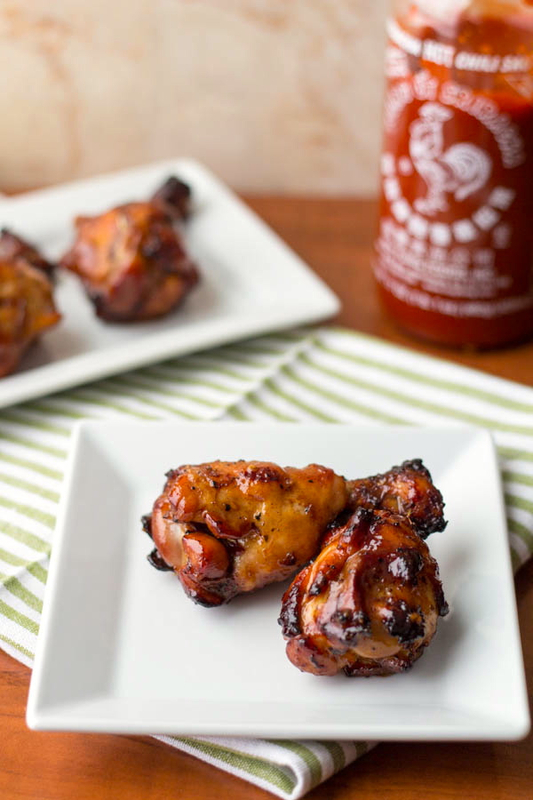 The star of the eating adventures today were these beautiful Sriracha Lollipop Chicken Wings here. Now let me tell you that my husband Erik is a master at cooking chicken wings. He knows how to cook them perfectly so that the skin is crisp and the meat is juicy, tasty and tender! 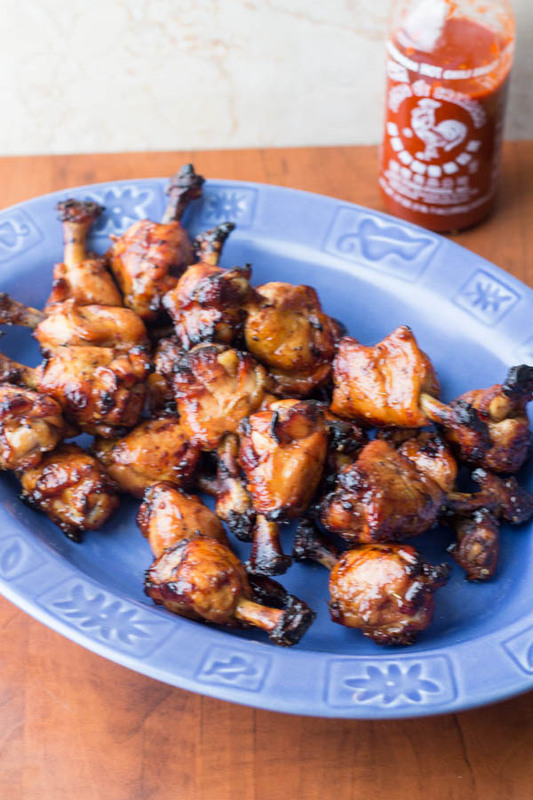 And yes, I know we just posted a Sriracha recipe lately (if you haven’t seen them, check out these Orange Sriracha Chicken Satay Skewers). But Sriracha is a regular star in Erik’s cooking repertoire. He uses it like it’s going out of style (which it isn’t thank goodness!! 😉 Oh man are these wings tasty! Now, why are they “lollipop” wings you might ask? Well I’m glad you were wondering! You see, Erik takes a sharp knife and cuts off the bottom portion of the skin, meat and tendon on the bottom part of the wing and you are then left with the nice meaty portion on the top! It makes a unique presentation for these tasty wings and also makes them easier to eat. Of course you can always just make them regularly, but I think this “lollipop” method is interesting and fun, so if you are looking for a new way to make wings; this is it!! I do hope you are enjoying your New Year! 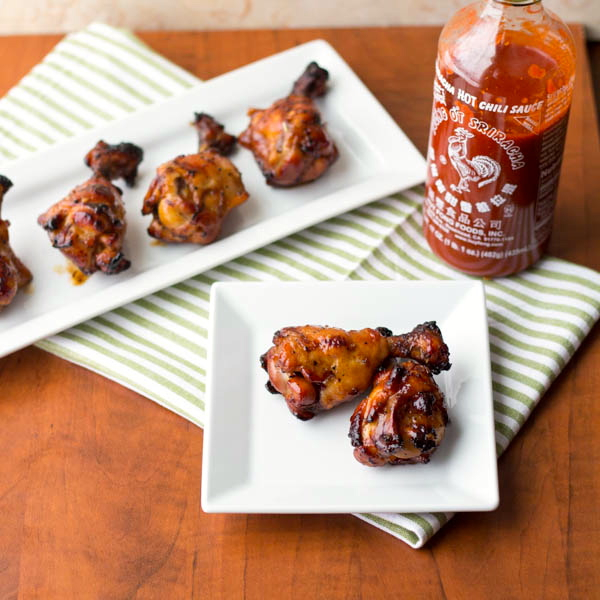 And I do hope you start it off with some fun and delicious food like these Sriracha Lollipop Chicken Wings! In a medium bowl, mix all marinade ingredients and put aside. Using a sharp knife, scrape the lower portion of each drummette (scape off skin, meat and tendons), exposing the lower bone. Put the drummettes in a large ziploc freezer bag and add half the marinade and mix around until drummettes are covered. Cover the remaining marinade and reserve in the refrigerator for later. Refrigerate the chicken in the marinade for 2 hours to overnight. Pat the wings dry with paper towels. Arrange the drummettes in a single layer on a roasting pan and sprinkle with chicken seasoning. Return the wings to the original pan and toss with the pan drippings. Place them in a serving dish and enjoy! Oh yum! These sound delicious. Anything with sriracha gets two thumbs-up in my book. Lovely recipe and thanks for sharing! I love Sriracha!!! These look so good! I am on a juice fast, but as soon as it’s over… this recipe is on my list of first meals! Glad you stopped by Jessica! I hope you enjoy the Sriracha wings!! Perfect as we head into the superbowl! Oh my gosh – these just might be the most beautiful wings I’ve ever ssen! And with the sriracha – I’m definitely trying them. YUM! Pinned! I am SO trying this recipe this weekend! Wow, these wings look sooo good! I just recently tried Sriracha for the first time and really liked it. I’ve been meaning to find a good recipe that uses it and this looks like the one! I’m gonna pin it to try it later. Hi Adrienne, Sriracha is fantastic isn’t it?? I hope you like the wings!! 🙂 -thanks for the pin! Oh my gosh! 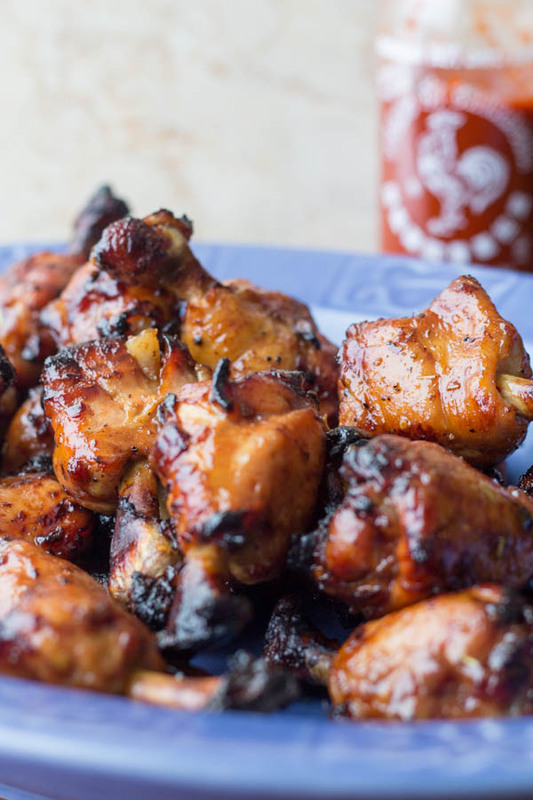 I can’t wait to make these – I’m sriracha-obsessed and I love how simple this recipe is. Thank you for sharing! So excited about this one. This is the best recipe! I made this 3 nights ago and I am making it again tonight. It is so easy to make and very delicious!